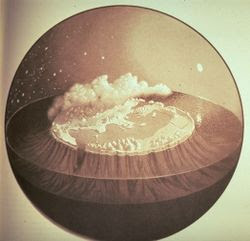 When I imagined what Mysterion might look like, the first image that popped into my head was that of Homer's conception of the world (depicted left). In the Iliad, there is a beautiful section that describes the shield of Achilles as being round as the world. Running around the edge of the shield is Ocean (pronounced "OH-kay-ahn"), which is the Greek equivalent of the Jewish "waters above the heavens." In other words, the world is surrounded by water, with boundaries of land and sky to keep it at bay. The centre of this Homeric world is earth (including our own oceans, seas and rivers). The sky is a great dome implanted with the sun, the moon and the stars. Beneath the earth are pillars extending into the deep waters the base of the universe, again much like the Jewish conception articulated in the Old Testament. In re-conceiving this ancient view of the universe, I imagined our world (the "normal" world) of Lethes to lie at the bottom of the sphere depicted above, and Mysterion is the real world located at the centre of the sphere. Ocean runs around the edge of the sphere, flowing down into Lethes in the East and upward in the West. Lethes is a kind of sedimentary world, where the remnants of Mysterion gather. This reinforces the idea of our "normal" world being the residue of Reality.